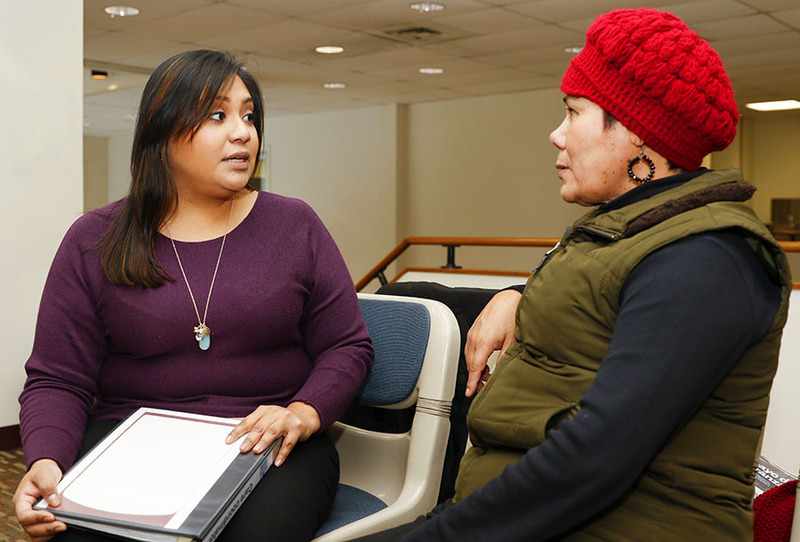 Lizette Martinez discussing care with Alivio patient Rosalina Romero. © Jasmin Shah | MHN ACO, 2016. Some patients feel like clinics are their second homes. Lizette Martinez, care coordinator at Alivio Medical Center, has seen this first-hand and knows how engaging with patients can make a difference in their lives – and their health. Lizette recently made a big difference in the life of a homeless patient with epilepsy who was in very poor health. The patient would constantly miss his appointments because the seizures caused him to forget about them. Lizette started to call and remind him about his appointments so he could get the care he needed. The patient was extremely grateful and now calls her when he has a question or concern. “I’m happy to offer any extra support a patient needs to get healthy,” says Lizette. Although Lizette has been a care coordinator for only one year, she began her career as a community health worker 15 years ago. She started as a peer support counselor where she did follow-ups with her caseload. This experience naturally transferred to the care coordinator role. Lizette notes that some of the most important ways to build trust with a patient are to actively listen, ask open-ended questions and become a trusted ally. It’s clear Lizette is following her passion – and doing it very well.